General Motors brands continue to be the latest focus of just-auto.com’s future models series. Recent features have covered Baojun, Wuling, GMC, Chevrolet and Buick, with Holden set to round out the series. But first, the emphasis turns to what’s ahead for Cadillac. GM is steadily updating and expanding its Cadillac model line-up. Sedans will continue to exist but certain of these will be phased out as the priority is on adding SUVs and potentially, EVs too. The brand’s sales are mostly flat in the US and China, its two main markets. This is due to an excess of sedans and a relative lack of SUVs. The addition of the new XT4 as well as next year’s ‘XT6’ should do much to change things. The CT naming convention for cars and XT for SUVs continues, with certain exceptions: why would Cadillac get rid of Escalade when it’s arguably the brand’s best known model, Cadillac’s president Steve Carlisle has logically stated. The new boss recently addressed the brand’s dealers at an event in Las Vegas, meeting many for the first time since his installation in the job back in April. Steve Carlisle is keen to stick with the basics of an ongoing decade-long reinvigoration plan started by Johan de Nysschen, the former president who departed Cadillac and General Motors in April. Next year marks the half way point of the ten-year turnaround. The XT2 or XT3, an additional model, would be related to the ‘CT2’ sedan, a potential Mercedes-Benz CLA-Class competitor. The small SUV would challenge the Mercedes-Benz GLA-Class, BMW X1, Audi Q3, Volvo XC40 and Infiniti XC30 from 2020 or 2021. As Cadillac’s newest model, the XT4 has great potential in both China and North America. A 4,599mm long rival for the BMW X3, Volvo XC60, Mercedes-Benz GLC-Class, Lexus NX and Audi Q5, the XT4 was introduced to the public at the New York auto show in March. October will be the first full month of sales, production having commenced in the US (Kansas City) and China (SGW’s Jinqiao plant) earlier in September. The new SUV is powered by GM’s ‘LSY’ turbocharged 2.0-litre four-cylinder petrol unit. This produces 237 horsepower (177kW) and 258 pound-feet of torque (350Nm). The sole transmission is GM’s own nine-speed Hydra-Matic 9T50 automatic. A facelift for this Epsilon 2 architecture model will likely take place in the second quarter of 2022. The second generation XT4 is due in 2025. 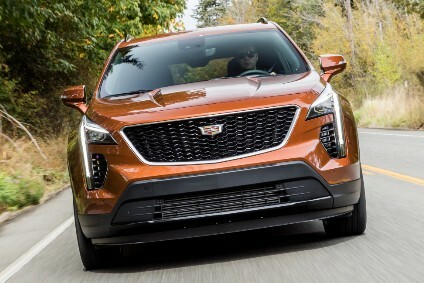 The XT5, which replaced the SRX, is one of three existing Cadillac SUVs, positioned above the new XT4 and below the giant Escalade. It is manufactured alongside the GMC Acadia with which it shares an architecture, production being at Spring Hill, Tennessee. There is build in China too. The Crossover Touring 5 is 4.8 metres long. The model had its world premiere at the Dubai motor show in November 2015, before being displayed in the US for the first time at the LA show later the same month. Cars for the US are powered by a 3.6-litre V6. The XT5 for China is built by the SAIC GM joint venture (SGM) and has a turbocharged four-cylinder 2.0-litre engine. There should be a facelift in late 2019 and a second generation XT5 in 2023. See the Electrified Vehicles section below for details of the XT5 Mild Hybrid. There is an obvious gap in the SUV line-up above the XT5: an SUV which would be targetted at buyers of the Volvo XC90 and others in the 4.8-5.0m long size class. An XT6 or XT7 is expected to be added in 2019. In theory, it should should share much with the XT5 and may even be an extended wheelbase version of that model although with a bespoke body. Both four- and six-cylinder engines are expected, as is a plug-in hybrid powertrain. The world debut will likely take place at the Detroit auto show in January. Cadillac’s largest SUV is the well known Escalade. The current model was new for North America’s 2015 model year, with production commencing in spring 2014. The product line consists of the standard Escalade, as well as the extended-length Escalade ESV, which offers a 14-inch-longer (355mm) wheelbase and approximately 20 inches (508mm) more in overall length. As well as more room for third-row passengers, the ESV has 60 per cent more cargo space behind the third-row seat than the Escalade. Both 2WD and 4WD variants are available, all powered by a standard 420hp (313kW) 6.2-litre V8. A Hydra-Matic 6L80 six-speed automatic transmission with enhanced TapShift control was originally standard but replaced by the eight-speed 8L90. GM and Ford’s ten-speed automatic transmission was then added for the 2018 model year. There should be a facelift for the 2019 model year. As the Escalade badge is so well known, this model will not change names and become an XT-number: i.e. the SRX was replaced by the XT5. The Escalade and ESV successors are expected to enter production during the third quarter of 2021. Some sources, however, claim that the next generation vehicles may instead appear as soon as the 2020 model year. GM is reported to be planning to make the next models more expensive and true rivals for the next generation Range Rover and Range Rover L. They will use the VSS-T architecture. The ATS and its made-in-China long wheelbase version, the ATS L, haven’t lived up to their potential. They use GM’s rear-wheel drive Alpha platform and were expensively engineered, the aim being to create an equal to the BMW 3 Series sedan. The first of the two to be announced was the ATS, the global debut taking place at the Detroit motor show in January 2012. US production, which started in July 2012, is at the Grand River plant in Michigan. Production of the sedan began in July 2012. As for the ATS L, this was launched in China in August 2014. Chinese production takes place in Shanghai at Jinqiao South, one of three SAIC GM plants in the Jinqiao part of Pudong. The L looks set to remain in production for a further couple of years but Cadillac is about to discontinue the ATS as well as the ATS-V, its high performance variant. The ATS Coupe will continue to be made for a while yet, Cadillac has stated. The ATS Coupe, meanwhile, is meant to be a rival for the BMW 4 Series Coupe. It went on sale in North American markets from July 2014 for the 2015 model year. A high performance ATS-V Coupe was a world premiere at the LA auto show in November 2014. A sedan was revealed at the same event. These are powered by a 339kW (455hp) 3.6-litre biturbo V6. They were new for the 2016 model year. The ATS Coupe (see CT3 below) will not be directly replaced, a quasi-successor possibly shifting down a size to where the BMW 2 Series Coupe competes. Production should cease at the end of North America’s 2019 model year. There is no 2019 ATS sedan. The CT2, proposed as an additional future model, would be aimed at the Mercedes-Benz CLA-Class. The car could share the rear/all-wheel drive platform of the ATS. There could also be a CT3, which would be a coupe. These cars might be the replacements for the ATS and ATS Coupe, even though they would logically be smaller so as to create some clear differences in size between the successors for the ATS and CTS. Cadillac may add the CT2 for the 2020 model year. ‘CT5‘ could be the name of a sedan which would replace the ATS and CTS as well as China’s ATS-L after production of these four-door cars ends in 2019. Some even believe that the CT5 may be revealed in China before the end of this year. Renderings of a two-door Cadillac, designed in Melbourne by GM Holden, surfaced in July. According to Cadillac Society, patent number D821,923 was applied for by a GM subsidiary on 14 February 2017. It was granted on 3 July 2018. It should be noted that Cadillac is not mentioned in the application but the renderings have clear design cues of the brand. The resultant production model might well become a ‘CT5 Coupe‘ in 2020. The CTS, meanwhile, is an existing sedan which is now in its last 12 months of production. No direct replacement is planned. The current model reached US showrooms from October 2013 for North America’s 2014 model year. The CTS-V had its world premiere at the Detroit auto show in January 2015. It was new for North America’s 2016 model year. The engine for this derivative is a 640hp supercharged 6.2-litre V8. A top speed of 200mph made this the fastest Cadillac yet. The V has a carbonfibre bonnet. Production commenced in mid-2015. The XTS is yet another sedan for which there will be no direct successor. This intended rival for the Audi A6 is in fact a far larger car – it is similarly sized to the A8. The XTS replaced two cars in North America: US production of the DTS and STS sedans ended in the second quarter of 2011. The SLS, which was a long wheelbase derivative of the former STS for China’s SAIC GM joint venture, was phased out in early 2013. A locally-built version of the XTS went on sale in China in February 2013 and was the effective successor to the SLS. This big front-wheel drive sedan had its global debut at the Los Angeles auto show in November 2011. GM Canada began building it at Oshawa in February 2012. A facelift was the most recent major news, this having been announced for the USA’s 2018 model year in June 2017. The XTS will not be directly replaced. That also means that the brand may eventually withdraw from the funeral car and stretched limousine/livery market. The car should remain in production until eventually being phased out at the end of the 2019, 2020 or 2021 model years: its sales haven’t fallen as badly as had been feared so GM seems likely to keep building it for longer than had been anticipated. The CT6 is yet another four-door Cadillac: it is easy to see why GM believes sales won’t suffer too badly even as multiple sedans are axed in North America. This large car shares some modules of its rear- and all-wheel drive architecture with the Alpha platform Cadillac ATS and CTS but this was the first vehicle for GM’s Omega architecture. The CT6 entered production at Detroit Hamtramck in late 2015. It is also made in China by SAIC GM, with the Pudong plant the only one of the two CT6 factories to be building the plug-in hybrid variant (see below). This big sedan is eight inches longer than a CTS sedan but weighs slightly less. The ‘6’ in the name is said to mean that it is sized between the BMW 5 Series and 7 Series sedans. A facelifted CT6 premiered at the New York auto show in March. At the same event, Cadillac revealed the CT6 V-Sport, an additional all-wheel drive variant powered by a 410kW (550hp) 4.2-litre biturbo V8 linked to a ten-speed automatic gearbox. The new V8, which is also available with an output of 500hp, is hand-built at the Corvette factory in Kentucky and is called ‘Blackwing’ within GM. Now, with the axing of the CTS-V in the coming months, Cadillac will rename the CT6 V-Sport, CT6-V. Prior to the 2019 model year, the CT6 had been offered with three petrol engines, each turbocharged (2.0-litre, 3.0-litre and a biturbo 3.6-litre), plus the PHEV powertrain. The fate of the CT6 remains unclear. GM will probably keep building it in China for some years yet, possibly even until 2023. US production will likely cease sooner than that, perhaps in 2021 or 2022. The company has likely not yet decided what to do about replacing the CT6. Probably it will wait and see what happens to demand for large premium brand sedans in the US and China over the next 12-24 months before committing to a direct successor. Another factor in what may or may not happen to the CT6 is the rumour that Cadillac could be planning to add a CT7 to its range of cars. The Escala, a concept at the 2016 Pebble Beach Concours d’Elegance, appeared to suggest that. The prototype was a big hatchback in the style of the Porsche Panamera. GM is said to be still exploring the business case for a CT7/Escala. It may turn out that there will be a new CT6 with a CT7 supplementing it in the style of the Audis A6 and A7 Sportback. From time to time rumours circulate of a model sized to compete with the Lexus LS too. Any plans for a hypothetical CT7 or CT8 are now said to have been shelved though. An XT5 Mild Hybrid is built solely in China. The model had its public debut at the Chengdu motor show in August 2017 but production didn’t start until this June. It is manufactured by SGM at one of the joint venture’s three plants in Jinqiao. There should be a facelift in late 2019 and a replacement towards the end of 2023. GM China might also be planning to offer an XT4 Hybrid or XT4 PHEV but this is not certain. The sole electrified Cadillac sedan is the CT6 PHEV, which is also known as the CT6 Plug-In. It was seen for the first time at the Shanghai motor show in April 2015 and went on sale in China in January 2016. It has combined power of 250kW (335hp) from two electric motors and a turbocharged 2.0-litre four-cylinder petrol engine. An 18.4 kWh LG Chem lithium-ion battery pack is located between the rear seat and the boot. The battery system is comprised of 192 prismatic pouch cells. Combined torque is quoted as 580Nm (432 lb-ft). GM China builds the plug-in hybrid version of the CT6 and exports it to the US and other countries. The CT6 PHEV was new for North America’s 2017 model year, the car going on sale there in March 2017. Cadillac announced a facelift for the 2019 model year CT6 range in March. The CT6 PHEV is due to be replaced in 2023. GM is said to be developing a fully electric crossover-SUV for Cadillac. Said to be potentially coming as soon as late 2019 but more likely in 2020 or 2021, this model will be a competitor for the Jaguar I-PACE, Audi e-tron, Mercedes-Benz EQC and BMW iX3. Production will likely be in China and the US with GM’s forthcoming Modular Electric Architecture as the basic platform. There is also a chance that GM might instead decide to make this model larger than the German and English E-SUVs, positioning it in the same size category as the Tesla Model X. More detail on the past, current and forthcoming models for General Motors brands can be found in PLDB, the future vehicles database which is part of QUBE.